Laparoscopic inguinal hernia repair can be performed using light- or heavyweight meshes. Apart from the size of the mesh, its friction coefficient (μ0) and flexural stiffness are of crucial importance to avoidance of hernia recurrence. 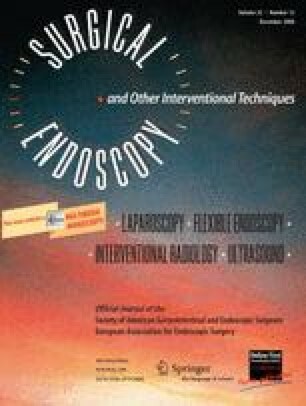 In the current biomechanical study, tensile tests were performed to determine the ultimate tensile strength and modulus of elasticity of six lightweight meshes and six heavyweight meshes for laparoscopic inguinal hernia repair. To determine their friction coefficient (μ0), the meshes were placed between a resected peritoneum and groin muscles during an autopsy. Meshes measuring 15 × 10 cm in size then were used in a hernia model with an opening size of 1.5, 3, or 5 cm. The ultimate tensile strength and modulus of elasticity were significantly lower in the lightweight mesh group than in the heavyweight mesh group. The mean friction coefficient (μ0) of the meshes was 0.4. Given an opening of 1.5 cm, all meshes remained adequately stable. At opening sizes of 3 and 5 cm, the lightweight meshes flexed on the average by 3.16 ± 0.4 mm and 10.40 ± 2.5 mm, respectively. Heavyweight meshes, on the other hand, were significantly less flexible. Their mean flexure was, respectively, 0.34 ± 0.2 mm and 3.97 ± 0.7 mm (p < 0.001). Stable meshes are characterized by a small degree of flexure and do not slide into the gap even when subjected to repetitive loads. Therefore, in terms of hernia recurrence, meshes with greater flexural stiffness or well-fixed lightweight meshes that adequately overlap the hernia defect can be used for laparoscopic treatment of large inguinal hernias.